Four years after reenacting the 1919 flight to Australia, the Vimy team was ready to follow the South Africans’ route down the length of Africa. 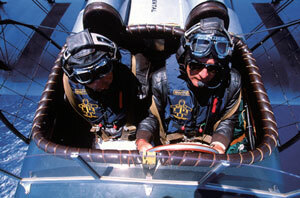 Wedged shoulder to shoulder in the cockpit of the Vimy replica were chief pilot Mark Rebholz and copilot John LaNoue. Photographer Peter McBride was in the nose gunner’s seat. Mary Brand, daughter of Silver Queen pilot C. J. Quentin Brand, wished the team well on June 1 as the Vimy replica left Brooklands, her father’s point of departure 79 years earlier. Cruising at 75 miles an hour, modern Silver Queen would have to cross 11 countries and two war zones and contend with bush airfields, mountains, limited fuel access, and winter in the Southern Hemisphere. The flights through Europe went smoothly, and before sunrise on June 22 the Vimy lifted off from Greece and flew across the Mediterranean to Egypt. Mark and John wore life jackets for the flight over the Mediterranean. Courtesy of Peter McBride. With the stress of crossing war-torn Ethiopia behind them, the team flew over the Great Rift Valley, marveling at the zebras, gazelles, and wildebeests roaming just a thousand feet below. Mark and John managed push the Vimy over Kenya’s high elevations, but faced near disaster after a flight to 13,000 feet to view snow-capped Mt. Kilimanjaro. On the Silver Queen’s return, a crosswind caught her wings, and despite the pilot’s quick reactions on the heavy controls, the starboard wing gouged into the dirt runway. The team recalled the original Silver Queen’s crash landing in Egypt and knew there would be no second Vimy for them. 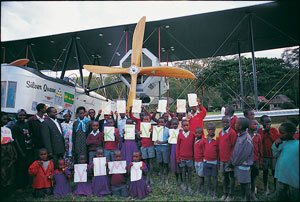 With help from colleague Richard Bonham and his Cessna, Mark and John returned to Nairobi for parts. Once repairs were successfully completed, the team continued their journey south. The Vimy project in Africa included a special educational program for students in Kenya and other countries visited by the Silver Queen. Photo courtesy of Mick Follari. After crossing through Tanzania, the Vimy flew for a few days from dawn to dusk, to make up for lost time. On July 24, the team soared across Victoria Falls, and Peter took a photograph from the same viewpoint where in 1920 Brand made the first aerial photograph of the 354-foot chasm. That evening, they touched down in Bulawayo. Some in the crowd well-wishers remembered seeing the original Silver Queen.